We know how hard it is to let workers in your home for few days. For that fact, we will pay extra care while working on the project & only prime painters will work for you. After preparing the house & painting it, we will make sure that everything is back in its spot. Any successful exterior work begins with thorough prep work. We know that this is the primary element if we desire the paint to stick. Our experience leads us to the ideal prep work. After the preparation step is completed, we will focus on applying the paint or stain in a smooth & efficient way which guarantee a winning look after drying. We proudly provide a large range of services. From the smallest house painting job and up to commercial & industrial locations, from the easiest job to the most complex. Just tell us what do you want – We are here for you. Steve Harper Painting works in Florida and surrounding areas. We are experts in residential and commercial interior painting & exterior painting and wall coverings in Florida. We are the top painting contractors in Central East Coast of Florida and we deliver every time the best in any aspect – service, workmanship, quality & materials. Steve Harper Painting offers full interior and exterior painting services and solutions for both houses, condos, apartments and commercial / industrial clients. Our house painters can do anything – from custom-made finishes for old and new homes, plus repaints and staining – with design and budget planning. Looking for house painters in Central Florida? Looking for a makeover? Steve Harper Painting is offering many options that will make fall in love with your home – again. Transform your walls! Steve Harper Painting does it all…from budgeting and planning to the perfect finish. Steve Harper Painting is devoted to give you a level of service that is unmatchable. 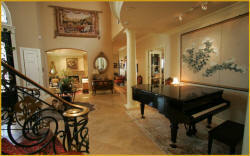 Our attention to details and the eye for design guarantee an enjoyable experience – like it should be in Florida. I have owned my business which I have operated proudly for 30 years. Offering interior & exterior painting services – for residential, commercial and industrial customers. I offer you an high-end, quality work done by professional painters with years of trade experience at a reasonable price. Plus, we are Lead Compliance Certified EPA Consultants.